The term "palmetto bug" is a general name commonly used to refer to several species of cockroaches in the southern U.S. and even some beetles. Other cockroach names are "waterbug" or "Croton bug." Unfortunately, these names can lead to confusion and misidentification, since any moderate- to large-sized cockroaches and even beetles are often called these by the public. Since habits and control measures often are species-specific, it is best to consult a pest control professional who can properly identify the species and then select control measures. A cockroach species commonly called a "palmetto bug" is the American cockroach (Periplaneta americana). Adult American cockroaches are large and winged. Their coloration is dark brown with a cream-colored prothorax that has dark markings that resemble sunglasses. 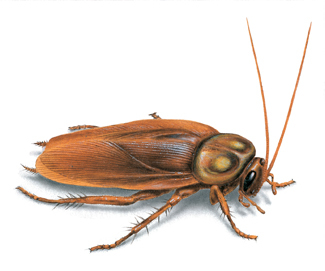 American cockroaches prefer damp conditions and often are found in sewers, woodpiles and mulch. They will fly to lights. This particular behavior is disconcerting for homeowners who encounter a large roach that flies near their face when entering doors with lights nearby in the evening. Another large species that may be called a "palmetto bug" is the smokybrown cockroach. The adults are a dark mahogany color and winged as well. They lack the sunglasses markings on the prothorax and are slightly smaller.